Well needless to say, that fits me to a tee! But of course I'm too much of a penny pincher, thrifty, frugal, ok, just too plain cheap to buy it when I can make it. So with the help of Picmonkey and The Graphics Fairy I put this one together. I printed mine as a 4x6 and stuck it in a dollar store frame. The hubby/Leigh's Dad, came home tonight and chuckled when he saw it - "Very appropriate" he said. 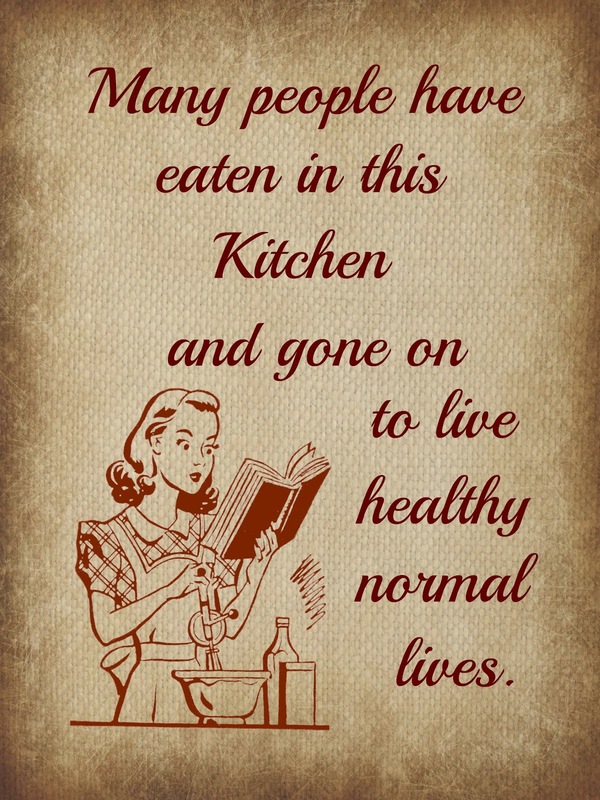 Everyone knows I'm not known for my cooking skills! In case you haven't noticed yet - I LOVE PICMONKEY! I've had so much fun with it and have probably talked as much about it as I have about Pinterest. I lead a very exciting life - LOL! 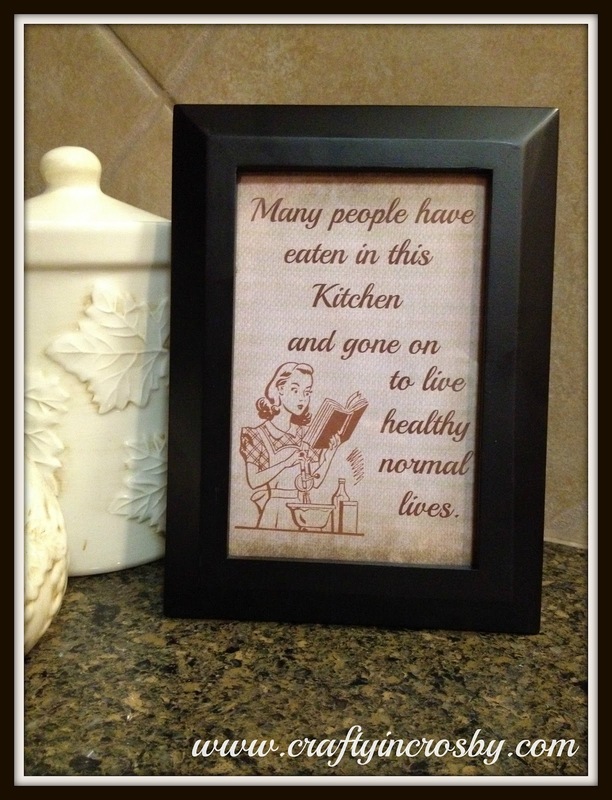 Hope you can find a spot for my little word art project in your kitchen! Let me know if you do. Ha, that is adorable, I LOVE IT. Thanks for sharing with the newbie party. Please have a visible link in your post at the bottom is fine. Thanks. That's funny! I love it and thank you for the download. Thanks for visiting Toodie! Enjoy! Wow! We are honored!!! Thanks so much and thanks for following us! This is so me. When Jim and I were getting married his family was worried he was going to starve to death. Jim's actually the main cook in our house. Thank goodness. Thanks so much for sharing this on the Our Favorite Things Link Party. Have a great week. The only thing that I knew how to cook when we got married (almost 31 years ago!) was Spaghettios and boxed macaroni and cheese!!!! LOL! Laughed out loud when I read it! Will go perfect in my (soon to be) new retro kitchen! Great idea and thanks for sharing! I'm still chuckling over it too! I'm your newest follower! Thanks for following and dropping by! You really need to check out Picmonkey - it is really easy and best of all FREE!!! My photos have improved immeasurably since I started using it. I'm following you now and love the bench you made. It is really awesome. Thanks for following! That is SO cute! Thanks for sharing! 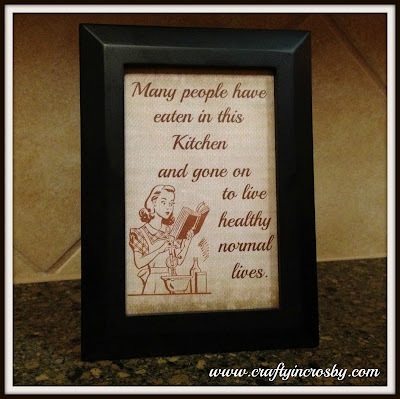 Stopping by from the mom blog hop and am now your newest follower:) Hope you can come check out Crazy Mama Drama ! Oh my gosh girl - your blog is hysterically funny! I'm following you back too! Thanks for dropping by and sharing the love! Thanks for having us over Julie! This is so cute! I love the vintage feel that it is. 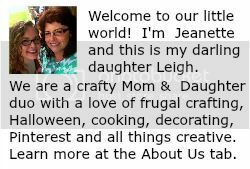 I am featuring you in the Newbie Spotlight....congratulations! Wow! We're in the Spotlight! Oh my gosh, I feel like a star! Thanks so much Gina. Your Spotlight post makes me proud! As Leigh says "Doing a Happy Dance". That sign is so hilarious. Well done, and frugally is GOOD! Keep smilin, and grats on Gina's feature on this post!!! Well deserved and earned. Thanks so much for the Kudos Gina! 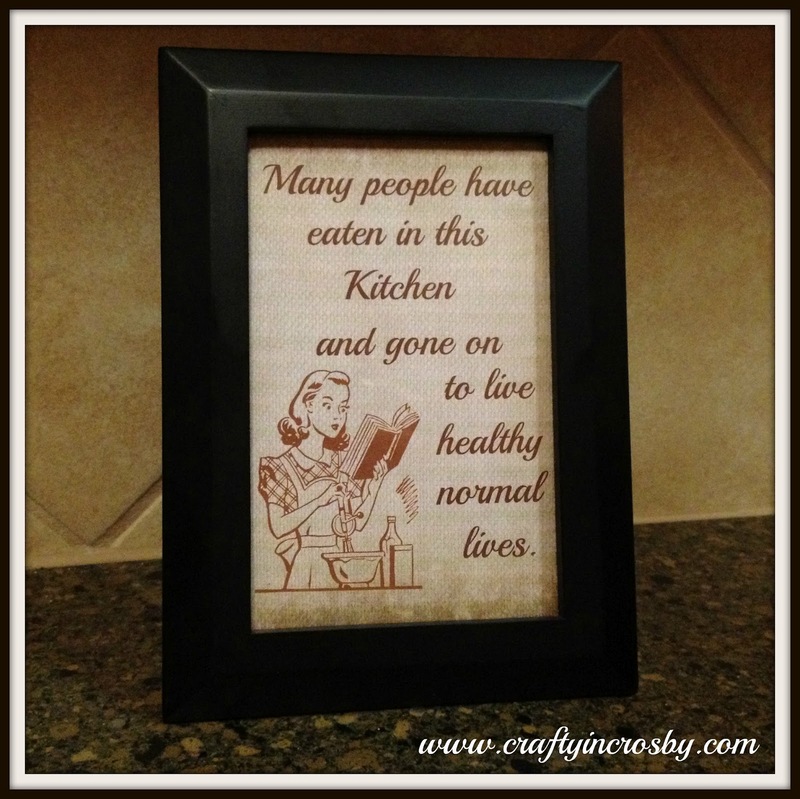 I'm one cheap crafter! The less money I spend on something, the more I like it. Thanks for visiting! How cute is that? I printed it out. Wasn't able to download it but that's okay! I see a trip to Kinko's! Thanks for sharing. My husband will appreciate it! Thanks Jaye! If you right click on the picture then select "Save image as" you will be able to save it to your computer and then you can print it out any size you want. Thanks so much for stopping by and I'm your newest follower! I love your study - the wood floors are beautiful and so is the wall color. LOL - love it! 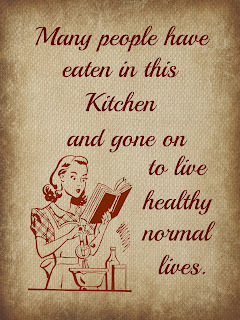 Especially since I am not a good cook...Thanks for sharing at the Pomp Party! Pinning to our Pomp Party board! Oh!! This is an awesome word-art!! Thanks for the printable! How fun! I like the picture, too. Thanks for linking to our party. It is nice to meet you! Wow Tara! We are honored!!! You just made my day! Love the saying! !Thanks for linking up at Romance on a dime's TIOT party!! What a cute idea, I'm going to make this as well but maybe on poster board! Laura from Real Momma stopping by to say thanks for linking up to the Best of your Best Blog Hop! This house runs on love laughter, and wine! Hope to see you Friday!